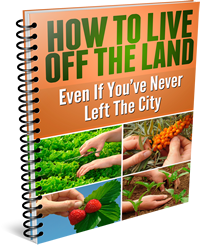 Learning hoe to compost at home is a good way to lay a foundation for a healthy and productive garden, and if your new to all this, you found yourself in the right place. 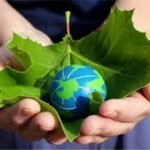 Let’s start by telling you that composting is a very old method of getting nutrients to the plants your trying to grow. It dates back to the time of the Roman Empire. Throughout the years, it has been modernized to an advanced tool for organic farming. Start by collecting ‘green waste’…..such as leaves and grass clippings, kitchen scraps such as egg shells, coffee grinds, even that coffee filter paper, and put it some inexpensive holding vessel outside. An old, or even new garbage can with holes drilled into the sides will do. Wet the mix lightly with water and mix using a pitchfork. Cover and let nature do its work. Add more waste when ever you get some and mix at least two times per week. Do not use any meat, dairy, fats and oil in any method of composting. Turning the mix is important. This process is called aeration and it is vital to aid in the decomposition process which is nothing more than inviting the growth of bacteria and fungus which will turn that green waste into a nitrogen rich material that your plants will thank you for by producing superior vegetables and or flowers. 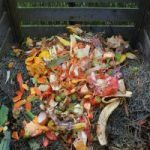 Vermicompost is the process of composting by using worms to help aid in the break down of organic materials of your ‘waste bin’. The digestive system of worms add beneficial microbes to to create a rich living type soil for the plants you are feeding. If you decide to go this route, Red Wrigglers are the most recommended and can be found on the net. 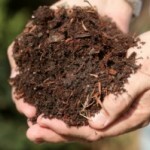 Compost teas is a simple compost at home trick when it comes to feeding seedlings or very young plants. 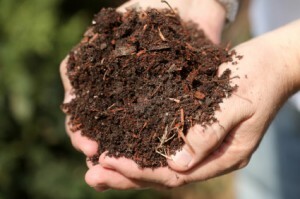 Simply put some of your rich compost in water, A general rule of thumb is to mix one part compost to five parts water. Let that tea sit in the sun for several days then get composting. Water those young plants with your rich organic tea. Any comments or questions are welcomed by posting below. Thanks!